Enjoy FREE Domestic Priority Shipping on Orders of $99 or More! We can notify you when this item becomes available. Great for skin/wound healing. Anti-histamine - alternative to Germ. Chamomile. Notes & Use Energetics Chemistry Recipes & Blends Safety Etc. The essential oil is extracted from the strongly aromatic buds, hairless and resinous. The collection is labor intensive and the yield is quite low for the essential oil. Balsam Poplar essential oil is also known as Balm Of Gilead, Balm Poplar, Black Poplar and Tacamahac. Balsam Poplar essential oil has been recommended for bruises, sprains, and strains, sore muscles and skin injuries. 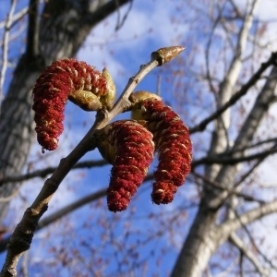 Balsam Poplar essential oil is also known for its scar reducing and wound healing effects. Balsam Poplar has been effective in helping eczema when blended in a salve of St. John's Wort . Balsam Poplar has been known to have a very strong anti-inflammatory effect. This is because of the oil's α-bisabolol concentration. It is also a wonderful analgesic and antispasmodic. It also known to reduce tension. Blends wonderfully with German Chamomile essential oil and Helichrysum italicum essential oil for rheumatism and arthritis or for skin issues. According to Tisserand & Young, Balsam Poplar essential oil may pose a risk to those on medications that are metabolized by the enzyme CYP2D6.